While planning your trip to Arkansas you might have found the town of "Dogpatch" on your Rand McNally in between Harrison and Jasper on Highway 7. Local residents petitioned the post office and the name of the town was changed to "Marble Falls" in 1997, but Dogpatch still lingers on many maps. Dogpatch took its name from an amusement park that opened here in 1968. Over a thousand acres were originally set aside for development. By comparison, Disneyland was forty acres. The park was based on a popular comic strip called "Li'l Abner" which was set in the fictional town of Dogpatch, know in the strip as the most miserable place on earth. (Contrast that with Disney's advertising slogan.) Here the park is today, seen from the highway. It doesn't look too bad from here, but it's been abandoned since 1993; and without a close inspection there's no telling what kind of shape those buildings are in. This spot has a colorful history, the early part of which can be found in more detail in the story titled Washington Monument Marble Quarry. This article will cover the public history of the Great Twin Parks of the Ozarks, Dogpatch and Marble Falls. In the mid 1960's, Disneyland in far away Anaheim, CA had been an important tourist attraction for a decade. Newer theme parks like Six Flags Over Texas had similar aspirations of transcending the familiar carnival midway style amusement park and were also drawing in crowds and turning out cash. A successful park was a money machine, and themers were cropping up all over. In 1966, Albert Raney, Sr. listed his family's Ozark trout farm and surrounding acreage for sale with a Harrison real estate broker named O. J. Snow. 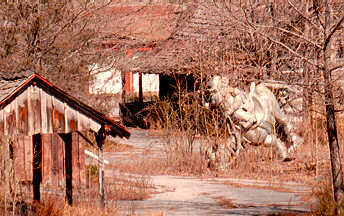 For years Snow had been mulling over the idea of an Ozark park with a pioneer theme, and when he inspected the Raney property it struck him that this would make a good location. The spring which fed the trout races could be dammed or diverted as needed. The water could be used to generate electricity or run a mill. Further, geological formations on the property reminded him of places pictured in Al Capp's satirical comic strip Li'l Abner. For instance nearby Mystic Caverns, already a commercially operated show cave, could easily stand in for Dogpatch Cave where Lonesome Polecat and Hairless Joe brewed Kickapoo Joy Juice. Also on the property was a canyon deep enough to be called "bottomless" for comic strip purposes. (The 55-foot waterfall found there provides Marble Falls with its current name. Yes I know that's a pun and yes I meant it to be.) There were legitimate, historical hillbilly cabins on property all over the Ozarks that could be had for the cost of hauling them away and reconstructing them in the park. 1967 Membership of Recreation Enterprises, inc.
How then to convince sophisticated Bostonian Al Capp, who had turned down numerous offers from hotter dogs to license the Li'l Abner millieu? Snow and a bunch of Northwest Arkansas business buddies formed Recreation Enterprises, Inc. (REI) to develop a presentation and pitch it to Al Capp. Primitive by today's standards, the pitch consisted mostly of home movies of the property. Snow went to Boston and showed him the movies and roughed out the plans for the kind of attraction Dogpatch U.S.A. would be. (That's according to the Gazette. According to interviews with Joe Nance and pat Moles, Capp and his Attorney visited the site, rather than movies being taken to Boston, of course, both could have happened.) Arts and crafts. Riding stables. Paddle boats. Pioneer technology. Honey hut. Fudge shop. Rustic homespun entertainment. Catch your own lunch. Corny skits by costumed characters. Train ride. No roller coasters or thrill rides. However they put it across must have rung the right bell, because Capp said yes and graciously consented to being made a partner. Although Capp had never specified the location of Dogpatch in his strip, he told newsmen that he had once driven through the Ozarks and "this was just about the section I imagined." Right about here people started wincing and rolling their eyes. Arkansans are more than a little sensitive about the hillbilly image, and anything that reinforces that stereotype just digs at us. Of course, we're stuck with it and we know it. We hate it, but we trade on it. Not only Dogpatch, but minor tourist stops like Pickles Gap and Booger Hollow all market the rustic, semiliterate stereotype to visitors. And while that stereotype isn't the rule, it's true enough often enough that we'll never be able to disown it unless we do something amazing like come up with our own space program. So Lou Oberste of the Publicity and Parks Commission expressed reservations, and Commission Director Bob Evans agreed that Arkansas has had difficulty shedding the image created by comedic actor Bob Burns and radio celebrities Lum and Abner. Reporters located and set upon a couple of Washington eggheads who were at the time visiting Arkansas for an economic conference. Reporters asked Edwin T. Haefele of the Brookings Institute and Leon N. Moses, Professor of Economics at Northwestern their opinions of the project. They both quickly decided that not only was the project doomed, but the partners were making a big mistake to even try. Said Haefele, "I don't think the attempts in the rest of America to repeat the success of Disneyland have come off, and I don't think this one will, either." Furthermore, amusement parks don't exactly increase the desirability of neighboring properties, and this might persuade more mainstream businesses to locate elsewhere. Sez you! There were assurances on the part of the partners that Dogpatch U.S.A. would be a class act with few rides of the carnival midway variety. Attractions would be quieter and more dignified. The trout farm would remain. There would be a botannical garden, an apiary, paddle boats, rides on pack trains, arts and crafts shops showcasing local artisans, mountain music and wholesome theatrical productions. With that plan in mind, everybody hopped on board. The Publicity and Parks Commission toured the site and agreed to help promote the new park despite their previous reservations. The Harrison Chamber of Commerce approved the Dogpatch plans for an 825 acre park. Here's something you'll want to keep in mind, a frequent pain in the neck to owners of the property throughout the decades. Nine-tenths of Dogpatch is in Newton County. The rest is in Boone County. So to do anything with the park you might have to get approval from Harrison AND Jasper. Mr. And Mrs. Capp made a three-day trip to Marble Falls to attend the groundbreaking, which took place Tuesday, October 3rd, 1967, and to discuss the development of the park. Attractions operating at the site even before groundbreaking were trout fishing, a boat dock, stage coach and trail rides, honey shop and apiary and some local arts and crafts. The cost of Dogpatch Phase I was $1,332,000 and included construction of Dogpatch, Skonk Hollow and landscaping. Phase II would entail construction of an RV park, motels, a golf course and amphitheatre at a cost of $900,000. "I only knew about the Ozarks from movies and things written by some people who never got out of Los Angeles." "Of all the by-products of my strip, this is the one I'm most proud of." "It looks like Dogpatch, but it looks clean and inviting." He also told reporters he was involved in the project "in a mystical way." He had turned down similar offers, but "This was the first time that anyone approached me who had the feeling for it." Economics Research Associates of Los Angeles was retained to study the potential of the park and to suggest price structures for amusements and concessions. They determined that Dogpatch could expect 400,000 visitors the first year, and projected that in ten years the park would have 1.2 million visitors a year, each paying $4 to get in. These projections turned out to be overly optimistic. Dogpatch had 300,000 visitors the first year and never publicly reported more than 200,000 a year from 1968 to 1993. 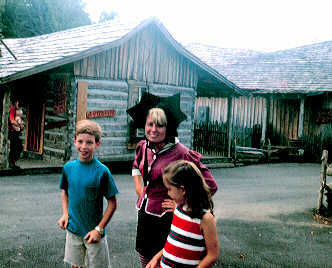 Board member J. H. (Jim) Schermerhorn purchased log buildings from all over the Ozarks. The logs were numbered, the buildings were photographed and disassembled, transported and rebuilt in Dogpatch. 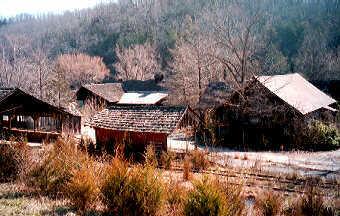 One of the things the park never publicized was the fact that many of those buildings in the park were authentic 19th century Ozark Mountain log cabins. Said Schermerhorn, "Dogpatch is a lot of fun in a dignified sort of way and will undoubtedly be a credit to Arkansas both culturally and economically." Dogpatch opened 17 May 1968 with a crowd of 8000 on hand, 2000 of which listened to Al Capp's dedication speech and witnessed the unveiling of the centerpiece of the park, a statue of Dogpatch's home-grown hero, Jubilation T. Cornpone. That's it on the right in the park's heyday. As the sheets fell from the statue, Mr. Capp said, "Doesn't that make you proud to be an American!" That first year Schermerhorn, as General Manager, reported that Dogpatch U.S.A. made a net profit of $100,000 from 300,000 visitors at the rate of $1.50 per adult admission, $0.75 per child. The park had done so well that the board planned to open Lower Slobbovia (Capp's cold-war Slavic counterpart to Dogpatch) for the 1969 season. During that first season, C.C. Capp (son of Al Capp) worked at the park where he met Vicki Cox, daughter of Mr. and Mrs. Harold Cox of Harrison. 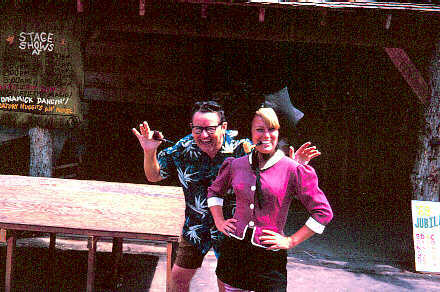 Vicki (who portrayed Moonbeam McSwine in Dogpatch) and C.C. were married at the 1st Methodist Church in Harrison on 28 October 1968. That October saw another change at the park. A central Arkansas mover/shaker named Jess Odom bought controlling interest in the park for $750k. Odom made his fortune from his interest in National Investors Life Insurance Company, from which he had purchased the old Maumelle Ordnance Plant and there founded the hugely successful planned community of Maumelle. He also had his finger in a lot of other commercial pies, car dealerships and what have you. Odom wanted to build a golf course and amusement park for his new town and was visiting theme parks looking for ideas when he discovered that brand-new Dogpatch U.S.A. might be up for grabs. That controlling interest came up for sale because of a disagreement between O. J. Snow and the rest of the original REI board. Mr. Snow passed away several years ago, but I spoke with his son-in-law Pat Moles who told me that Snow wanted to put the first year's profits back into the park. The rest of the investors (there were fifteen by now) wanted to take some money off the table. Snow finally got tired of trying to persuade this group and sold his interest to Odom, who also purchased stock held by other REI members. Joe Nance told me in a phone interview that Odom was introduced to the board by a board member who expected Odom to spend large sums of cash to expand Dogpatch quickly. According to Moles, Al Capp had some misgivings about the change in leadership. Capp had agreed to the licensing agreement with Snow because they saw eye-to-eye on how the characters were to be used. Capp didn't want some parking lot with a bunch of cheap rides in it to have a "Dogpatch" sign hung over the gate. Capp trusted Snow, but he had no idea what this new guy would do with what amounted to his life's work. On the other hand, Joe Nance, the last surviving original REI board member, said that Capp and Odom were on the same page concerning the future of Dogpatch; and the long-term licensing agreement between them suggests that they were of one mind. Odom would get exclusive use of the Li'l Abner characters, name's, titles, jargon and the events of the cartoon for use in this or any other franchised Dogpatch theme park for ten years with two options of ten years each. So if all options had been excercised, the deal would have run out in 1998. In return for this extraordinary concession Capp got a pretty extraordinary fee, between 2% and 3% of the gross from admissions. Odom planned to invest an estimated $5M-$7M in expansion, upgrades and improvements, starting with the addition of Skonk Hollow. 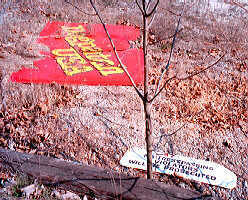 For eighteen years Skonk Hollow was next on the list of improvements to the park, yet it never seemed to materialize. Tomorrow, always tomorrow. Odom did another thing which I'm sure seemed pretty shrewd at the time. For the 1969 season he hired former six-term Arkansas governor Orval E. Faubus to serve as General Manager of the park and President of REI. Faubus had recently lost an election to Winthrop Rockefeller, and had some time on his hands with little else to do but run his string of small-town newspapers. Rather than let his long list of personal and political connections go to waste he applied them to the running of Dogpatch, which he said compared favorably with the running of the state. Quoted in the Gazette, "In both occupations you have similar problems. A lot of tried and true methods that I perfected while governor work out surprisingly well here." When invited to elaborate he said with a wink, "We all have to keep some secrets.... Both are like running your own private little war sometime. Know what I mean?" The opening of the second season had to be postponed due to bad weather, construction delays and late delivery of new rides which Jess Odom had bought for the park. Improvements and conveniences were added to Dogpatch in the form of 120 camping spaces and a 62 unit "Mobile Motel." I'm not exactly sure what that meant, but it sounds like somebody's trying pretty hard not to say what it really is. 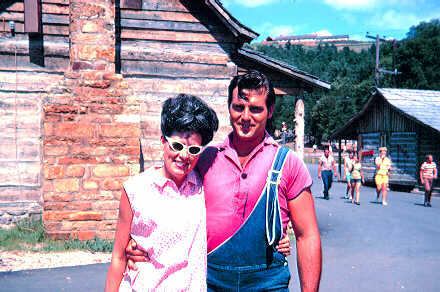 In March of 1969, hillbilly was in fashion. On television, this was the era of "Green Acres" and "Petticoat Junction;" and the phenomenally popular "Beverly Hillbillies" were filming their "Back to Bug Tussle" episodes a few miles away at Silver Dollar City. Al Capp's comic strip "Li'l Abner" appeared in over 700 daily newspapers all over the United States, practically an ad for the theme park run nationwide every day. Meantime, Capp had signed separate deals for a string of franchise theme restaurants and another deal with Warner/7 Arts for the TV rights to Li'l Abner. Here at Dogpatch the first annual Daisy Mae beauty pageant offered prizes of thousands of dollars in scholarships and gift certificates. All of those things combined to make hill country hip and to keep reinforcing Dogpatch in the American consciousness and all of it a windfall for Jess Odom and his park. Dogpatch was a budding commercial leviathan, a potential marketing juggernaut. What could possibly go wrong? By 1971 things were going well enough that Jess Odom offered to buy out the rest of the minority investors. He bought out ten of them for $700,000 and although a couple of original stockholders held a few shares, Odom was for all practical purposes the owner of Dogpatch. He formulated a $5M-$7M expansion plan to gear the park for year-round operation and set up a new board of directors. So here's the plan. On the hilltop overlooking Dogpatch, right next to the Auto Museum housing Jess Odom's personal car collection, REI would build a ski resort complete with three ski runs (two beginner and one intermediate), a 50'x140' indoor ice rink, a convention center and toboggan run. To help finance the endeavor 600 residential lots would be sold and a number of A-frame time share "chalet's" were constructed. Two 64-unit motels would be built. This hilltop complex would be called Marble Falls, and REI spent big to build it in time to open by Christmas of 1972. It's awfully easy for us to play Monday morning quarterback and marvel at the foolishness of undertaking such a massive expansion during precarious economic times, but the fact is that when he started the expansion it wasn't foolish at all. Jess Odom was a big boy. He'd developed property before. He was involved in the insurance business and surely understood business risk with the eye of an actuary. I can't accuse him of not being cautious and canny. He did after all buy a controlling interest and ran the park for two seasons before buying the rest of it. He did his homework, discovering that Americans spent more money on skiing than on golf and that Harrison averaged 77 of 90 winter days were cold enough to allow the manufacture of artificial snow. A fancy-pants Los Angeles consulting firm who developed projections for the likes of Disneyland and Six Flags had told him that by 1977 Dogpatch would be drawing 1.2M visitors a year even WITHOUT a ski resort. His bet was a good one, perhaps overly bold, but still reasonable for a guy who was used to doing bold things and pulling them off. His only sin at this point was that he did not forsee the unforseeable. He had no idea and could not possibly have known that in the next five years, seven bad things were about to happen. Attendance projections by that fancy Los Angeles consulting firm were going to prove to be remarkably wrong. Interest rates were going to double in the next 12 months. Arkansas would have a string of mild winters. The Arabs would cut off our oil, drastically reducing tourism. Every network TV program set in the country would be replaced by one set in the city, and overnight rural stopped being fashionable and started being passe. Al Capp would retire and Li'l Abner would disappear from America's funny pages. That Li'l Abner TV show and the theme restaurants weren't going to happen. Whether intentional or not, whether deserved or not, OPEC, The Federal Reserve, Hollywood and Mother Nature all ganged up on Jess Odom and his enterprise. The ski season got off to a late start because the six snow cannon ordered by Marble Falls were stuck in transit. Cargo flights out of the Denver airport had been cancelled due to an ironic snow storm. Freezing rain and snow fell on the state on projected opening day anyway, creating hazardous driving conditions which kept visitors away. The snow machines eventually arrived. It turns out you can't just blow out a pile of synthesized snow and start skiing on it. The snow cannons would only operate if the ambient temprature was below 28 degrees F, so the machines usually could only operate for a few hours in the dead of night. Conditioning of the slopes took sixteen days, and the slopes were ready about New Years 1973. A January snow storm topped the synthetic stuff with the genuine article, and at last conditions were declared ideal. For a few weeks, Marble Falls was packed with guests. The skating rink was full. The slopes were busy. The weather was cooperative, and the resort was making a pile. Spring came early that year. As of 18 February the machines could no longer maintain the slopes. That season was half as long as the one Odom had expected to present, particularly disappointing since it was Marble Falls' first. The Arab Oil Embargo began at about this time, ushering in lean times for tourism and driving up operating expenses. 1974. In hopes of providing his guests with a greater selection of indoor entertainment, Odom entered into an agreement with the interim president of the University of Arkansas and Fayetteville, Charles Oxford. Under this agreement, Odom would fund grants for 4 university staff positions and 12 acting scholarships for a student repertory theatre group called "The Boar's Head Players" for three years. He laid out $17,000 for the first year. The company would be headquartered in the Marble Falls convention center during the summer session. 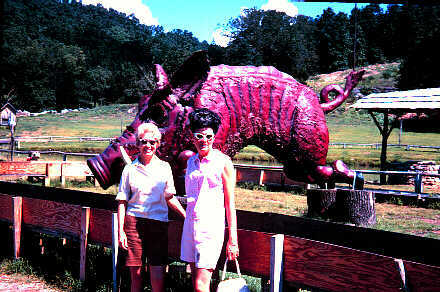 The project was titled "Arkansas Rediscovered." Its stated intent was to encourage the development of original drama on Arkansas themes for the upcoming Bicentennial Celebrations. Announced in April, the summer season was to consist of three well-known plays plus some childrens' theatre pieces. Sounds like a pretty shrewd move on Odom's part. For $17,000 he books four or five shows into his theatre, and he gets to handle the box office. What actually occurred, though, according to David Wright, present box office manager for U. of A. Fayetteville, was that the Boar's Head Players mounted two productions that first summer, one called "The Hollow Crown," the other a musical review, "The Best of Broadway." This was a season far short of what Odom had announced. And being a nonprofessional troupe, they had no union to handle redress of grievances by an employer. The Boar's Head Players did not return to Marble Falls, although the company still exists at the U. of A. The Twin Parks struggled under the burden of high-interest, short-term debt. When Odom broke ground on Marble Falls, interest rates were low. A 6-month CD paid right around 4%. In March of 1973, by which time he knew his first winter season was a bust and he would have needed cash, that same 6-month CD would have paid almost 7.5%. Odom would have paid significantly more than that on a mortgage. It was suddenly a bad time to borrow, but circumstances left him little choice. He borrowed $1.5M from Union Planters Bank in Memphis, adding to his debt of $2M which he borrowed from the same bank in May of 1972. There were brief periods of good stout winter weather, but never enough to crack the nut. Mild winter followed mild winter and Marble Falls couldn't carry its own weight. Dogpatch made a modest profit every year, but couldn't overcome the burden of Marble Falls. In 1976 the wolf came to the door. Union Planters sued Odom, his son Michael and Marble Falls Estates, seeking foreclosure on $3.5M in mortgages, security interest and notes. At this time, Dogpatch and Marble Falls were incorporated separately. Father was president of Marble Falls. Son was president of Dogpatch. The bank accused Odom of pulling a fast one, transferring some of his Marble Falls properties to Dogpatch to keep it out of recievership. Union Planters says wait a minute, that property is collateral on loans we made to Marble Falls. They asked a judge to void the transfer. In 1977 First National Bank of Little Rock filed two suits against Jess Odom, his Buick Dealership and Marble Falls, seeking foreclosure on $606,217 in debts. Also in 1977 Al Capp retired. Li'l Abner disappeared from 700 daily papers and a keenly popular fictional universe began to fade from the public consciousness. In September, Jess Odom announced that Marble Falls has lost $50k to $100k every year since it opened and would close permanently as of 1 October 1977. The ice skating rink will be converted to a roller rink, saving $3000 a month in refrigeration costs. Closing the ski slopes will save $22,000 a month in costs to make artificial snow. Sixty or seventy employees lost their jobs. In January of 1978, Dogpatch reported that the 1977 season entertained the most visitors since the first year and enjoyed the most spending per visitor ever. In the 1978 season, the Twin Parks paid just under 600 employees just over a million bucks. It spent $750k locally on goods and services, paid $175k in taxes. I estimate the interest on Jess Odom's loans to Union Planters and 1st National to be about $500k a year, and he also had taken out several smaller loans from Savings and Loans in Batesville, Stuttgart and Wynne. In 1979 Dogpatch USA recorded its first unprofitable year. Also in 1979 Odom announced before a meeting of 350 members of the National Full Gospel Businessmen's Association that negotiations were under way to sell Dogpatch to a nonprofit, nondenominational Christian group named God's Patch, Inc. Under God's Patch, the park would be converted into an entertainment and convention center with a biblical theme. God's Patch was headed by local real estate tycoon Clyde Rill. Odom says that negotiations have been going on privately for a couple of years, and that Rill's option to buy the property runs out in September of 1980. Rill announced that one businessman, who wished to remain anonymous, had pledged a million bucks to be applied toward the purchase if only matching funds could be found. Nobody went for it. The high interest on those monstrous loans was killing the Twin Parks. Odom desperately needed to refinance at a lower interest rate and longer terms. He approached the Harrison City Council with a proposal for the issuance of $9M in tourism bonds, $7M of which would be used to pay off existing debt, including $3.3M to Union Planters and $500k in local unpaid bills. One provision of the proposal was that $708k would be used to purchase shareholder equity. Since Odom owned practically all of the shares, his proposal boiled down to the City of Harrison assuming the debt and buying the park from Odom for his original purchase price and then hiring God's Patch, Inc. to operate the place. Other money from the sale of bonds would be used to pay off notes held personally by Odom, his family and his other business ventures. Essentially he wanted back the personal cash he'd put into the park. He pledged at least 75% of the park's profits to be applied toward retiring the bonds. $843k per year for 28 years would retire the bonds. Never mind that Dogpatch in its best year never made half that, and Marble Falls had yet to net a dollar. The Harrison City Council voted unanimously to think about it. They told Odom that before they could decide, they'd have to examine his books for the last five years. They also mentioned that 95% of the park wasn't even in their county, so why should they assume the full burden of maintaining the value of property that's taxed in Jasper? Within a week of that meeting, two suits were filed in Federal Court regarding an injury suffered in June of 1978 by 4-year-old Shelly McMurray of Winsor, LA, who fell 20 feet through a gap between a ride and a loading platform causing injuries to her spine, physical disfigurement and permanent disability. Ms. June Evans Finley of Monroe, LA acquired pretty much the same injury when she leaped like a panther from the platform to assist the child. The suit said the park failed to warn customers of dangerous conditions, failed to provide adequate guidance to employees, failed to place proper barricades and rails and were negligent in design and maintenance of rides. In short, the usual personal injury shopping list. The suits demanded $150k for injuries to the child, $15k to the parents for medical bills and $50k for Ms. Finley. After taking a look at Odom's books, the Harrison City Council rejected his proposal for a $9M bond issue. Odom said, Okay, how about $5.25M? Seriously, it was just that quick. He had prepared a fallback position and had brought with him five businessmen who were presented as individuals versed in theme park management. They were not named in the newspaper aticle, but they said they would be able to provide a detailed feasibility study on the park's potential success. Council members Kay Hollingsworth and Tom Reed went on record as saying that the whole community was against any bond issue. The citizens generally agreed that Odom was trying to pass off a hot potato and they weren't going to take it. In 1980, Ozark Mayor Gary Briley said he would propose to the city council that they issue $9M in tourism bonds to pay off REI's debts and move Dogpatch to a spot between Altus and Ozark, near the Altus wineries, which already drew sizeable crowds. Former state congressman Jack Phillips said he and a group of California businessmen were working out the details. Marvin Vinson, head of the Clarksville Chamber of Commerce approached Odom with the idea of moving Dogpatch to Clarksville, putting it right on I-40 instead of way off the beaten track. Odom said he was not interested in being the owner. A new business entity appeared, calling itself Ozark Family Entertainment (OFE). Their plan is not to pay the debts and buy the park, but to assume the debts if Newton County (that's Jasper, the earlier bond proposal was to Harrison) would issue $5M in tourist bonds, the retirement of which would be accepted in lieu of property taxes. So not only were they asking for cheap money, they were also asking for a free ride on property taxes on almost a thousand acres of developed property. OFE representative David Hale said that his group had no association with Odom other than negotiations over the park. It wasn't the plan they had two months before, but by April OFE was negotiating to purchase Dogpatch. The sale was overwhelmingly and not surprisingly approved by the shareholders of Dogpatch USA. OFE was also negotiating to buy Marble Falls, but God's Patch was still considering that property as well. The Newton County Quorum Court agreed that IF OFE could find buyers to commit to the purchase of ALL the bonds AND IF they could convince Dogpatch USA's unsecured creditors to accept bonds in lieu of payment, THEN AND ONLY THEN would they issue $5M in Act 9 of 1960 tourist bonds. OFE said that the tax-exempt bonds had ready buyers, so Newton County wouldn't be stuck with the debt; and that 4 secured and 5 unsecured creditors have agreed to take the bonds to cover their debts. The others would have to be paid in cash. Transfer of the park couldn't take place without the bond issue to settle Odom's debt, so OFE managed the park for the 1980 season while REI retained ownership. The banks and the S & L's were waiting for the summer of 1980 to see if Dogpatch under the leadership of OFE and operating unencumbered by Marble Falls would be profitable enough to pay off the bonds. The summer of 1980 was the hottest in Arkansas' history, marking more 100 degree days than in any summer since settlers began keeping records. Trees withered, forests burned, streams dried up and lakes and ponds shrank to puddles. People stayed indoors. As a result, Dogpatch had not such a good year. In its whole history it had lost money twice, in 1979 and 1980. At the end of a miserable August, thirty unsecured creditors refused to accept bonds as payment. So did 1st Federal Savings and Loan Association of Stuttgart, which sued Dogpatch and Marble Falls for $303,035.95. The Stuttgart bank had not made the loan, but had acquired it from 1st National Mortgage Company of Little Rock. 1st Federal S&L of Harrison sued for $43,566.44. Independent S&L of Batesville sued for $90,675. Those loans were secured by the Dogpatch post office and real estate, 15 chalets and two malls. OFE agreed not to acquire the contended property or assume REI's debts on that contended property. The banks that accepted the bonds were in pretty much the same shape as before. In an unrelated lawsuit, 1st National Bank of Little Rock foreclosed on a 1500 acre wildlife club in the Lost Mountain area. Jess Odom and his partners Bill Silver and David Hale are behind in their payments on the $631,430 mortgage. It was David Hale of OFE who said just a couple of paragraphs above that he and OFE had no connection with Jess Odom other than negotiations for the purchase of Dogpatch. By the way, Bill Silver and Wayne Thompson of OFE had both been General Manager of Dogpatch. I'm not calling anybody evil, I'm just pointing out some inconsistencies in the record. Within a month the deal was off. Because of the miserable heat, which caused a money-losing season, Dogpatch had asked that the bonds be issued with moratorium on payment. They just wanted to delay some payments until they could get their operation back in the black. Union Planters would have none of it, and they withdrew their offer to buy $4.3M in bonds. In October of 1980, Union Planters filed in Boone County to take possession of Dogpatch and Marble Falls. According to Odom, Union Planters had "first mortgage on practically everything." On Monday, 3 November 1980, Dogpatch filed for bankruptcy. Their petition listed 90 creditors owed $3.12M which REI could not pay, including $70,077 to Al Capp of Boston and $1.85M to Jess Odom of Maumelle. Until those creditors could be satisfied, OFE could not buy the park. That winter was a discontented one. Upon foreclosure, Union Planters took posession of over a thousand acres, most of the chalets, a 22-unit hotel and apartments, another 12-unit hotel and apartments, a post office, restaurant and service station. Charles Parker, Vice President of Union Planters was in a hurry to sell Dogpatch, since the bank wanted no part of running a faraway money pit. He determined that Dogpatch would not be opened for 1981, and even considered converting it back to raw land. Odom had mortgaged the property for $3.5M and still owed $3M when the bank foreclosed. The lawsuit with the 4-year-old Louisiana girl was settled for an undisclosed amount. Against all odds, Dogpatch opened the following spring. (Actually, that should be the title of this article.) A new company, this one called Ozarks Entertainment, Inc. (OEI), headed by Wayne Thompson (formerly a principal in OFE), Dogpatch's General Manager, bought Dogpatch, the greenhouse, and some acreage. The purchase price was not disclosed. The bank retained the Marble Falls properties and auctioned them off as scheduled on 7 April 1981. Wayne Thompson had managed Dogpatch in 1974 and 1975 and had then moved to Daytona Beach, FL and managed a park there for a bit. Under his leadership, according to Joe Nance, the park made money every year. His administration emphasized new promotions, landscaping and arts and crafts. The peak summer staff was 250, downsized from 600 the previous year. New attractons for '81 included a wood carving shop, a grist mill, a glass blower, a puppet-making studio, pottery shop, needlecraft shop and a dog act called "Moore's Madcap Mongrels." A short roller coaster ride called "Earthquake McGoon's Brain Rattler" made its first appearance that summer. The shmoo was introduced to the park. Some poor dope had to wear a giant stuffed shmoo costume in the heat of summer in the Ozarks. Sam Southerland, a partner in OEI and accountant for the park said, "This park is going to go. I'm convinced of it. We want to attract a quarter of a million people a day." The 1981 season featured personal appearances by Reba "I Don't Think Love Ought To Be That Way" McEntire and Hank "Six Pack To Go" Thompson as well as Captain America and Spider Man. Dogpatch reported a 21% increase in attendance in 1981. This was encouraging, but not surprising, given the biblical heatwave of 1980. 1982 featured "Stacey Moore's Trained Animals." I wondered briefly about the name change from "Moore's Madcap Mongrels," but decided it was probably a family matter. The Thompson touch included a lot of corporate sponsorship. The Dr. Pepper Theatre was home to the animal act. The Coke Pavillion was new; and the Coca Cola Company sold season passes called "Heckuva Season Pass" for $7.95 plus tax, just about the cost of a regular admission. The Tyson Chicken Hut was added under the Thompson Administration. Thompson promoted the park relentlessly. Denver Pyle (Uncle Jesse from "The Dukes of Hazzard") was hired as spokesman for the park, and appeared in person May 29th and 30th. Batman and Robin were on hand to sign autographs August 7th. Thompson also booked in bluegrass and gospel shows. As with most things in Arkansas, Dogpatch was a mix of crass and class. Along with events like "robot day" Thompson undertook to rebuild the historic Marble Falls water wheel. Dermot McGuigan of Montpelier, VT and William R. Ball of a Little Rock Firm called "Natural Environments" were hired to reengineer a wheel from specially harvested red and white oak dried in a solar kiln. The 34-foot diameter wheel was put together with historically authentic mortise and tenon joinery and hung on the cliff face from the original 8-inch diameter iron axle. In 1983 Larry and Judith Browder of Aurora, Illinois filed a $95k suit against the park for injuries to their 9-year-old daughter, who fell off a handcar ride and lost parts of her middle and ring fingers when the wheel rolled over her right hand. Plaintiff says there are no safety belts on the car, so that's negligence. Defendant says the State Labor Board routinely inspects the park and recommended that this particular ride have no restraints. Witnesses also said the girl's brother pushed her off the car. Back to Jess Odom and his problems. Federal Bankruptcy Judge Dennis J. Steward approved a plan for debt reorganization. A new company called Dogpatch Properties, Inc. (DPP) made up of northwest Arkansas businessmen would buy all the foreclosed Marble Falls Property for $1.6M. They will in turn sell interests in the properties to pay off $1M in secured debt. After that, unsecured debt will be paid off. Jess Odom will administer the plan for expenses only. Surely motivating him is the fact that Odom Enterprises made unsecured loans to Dogpatch USA to the tune of $2.1M. Stuff happened in 1983. First, Arkansas got a new Federal Bankruptcy Judge (Robert F. Fussell) to replace Steward. Fussell retained juris diction over disposal of the property. Second, Arkansas got a new law governing the sale of time-shares. That law was a modification of a model law authored by the American Real Estate Licensed Law Officials and sponsored by State Representative James L. Shaver of Wynne. Perhaps coincidentally, an S & L in Wynne held debt secured by Marble Falls property and expressed distrust over DPP's plan to sell time-share intervals. While time-shares were old hat in Florida and California, they were fairly new in Arkansas, and Don F. Hamilton (lawyer for the S & L's) said his clients viewed the time-share concept as "speculative" and have been fearful of it from the beginning because there's no equity in a time-share. Another company, this one named Buffalo River Resorts (BRR) appeared. Its sole purpose was the sale of time-shares owned by or acquired from DPP. (These companies just passed the properties down the line like a bucket brigade, although I suspect BRR was created in order to keep the stigmatized name "Dogpatch" off the sales brochures.) Act 294 of 1983 (excerpted below) darned near shut them down for a spell. One provision in the law required that the properties be registered with the Sate Real Estate Commission before they could be sold. Doing so would require that BRR furnish the purchaser with releases from all leins or to put up a bond or buy insurance or to provide a document in which the mortgage holder subordinates his rights to those of the purchaser. What that meant for BRR (and therefore for DPP and therefore for Odom, who had taken out $1.6M in second mortgages on the property) was that they couldn't sell time-shares without a note from the banks surrendering their claim to the equity. So that's the freaky part. The purchaser of a time-share, which contains no equity, could cause the loss of equity by the holder of the first mortgage. Everybody clear on that? On the other hand, without that provision, if the seller (DPP, essentially Odom) defaults on his payments to the holder of the first mortgage, the buyers of the time-shares get screwed out of whatever they paid so far and the transfer of the property to the first mortgage holder satisfies DPP's debt. On the other hand, since Odom owns the second mortgage, if is able to talk the banks into subordinating their leins to the rights of the purchaser, then concievably Odom could buy the property from himself, miss the first payment, foreclose on himself and own it, leaving the banks to write off a bad debt. I seriously doubt that any judge would allow for an interpretation of the law as extreme as the last example, but you can see that things started to get impossibly complicated regarding questions of who owned what and who could make decisions regarding the sale of what. So now that the situation has reached a point such that it can not be understood, the question arises as to whether or not Judge Fussell should retain juris diction over the transactions. After all, the original reorganization was filed by Dogpatch USA, which sold the theme park to OEI and sold the rest to DPP, which assigned the property to BRR which attempted to sell, not the property itself, but time-shares to the public. After all, how far beyond the original transactions should the Judge follow the case? Until the owner of the first mortgage is satisfied? The second? Until nobody owes anything and all property is owned by somebody free and clear? Roy Bilheimer, Director of the State Real Estate Commission, insisted that BRR or DPP or whoever was going to try to sell the time-shares comply with the law because, "One of the elements of the law is that purchasers do, in fact, get what they bought." The banks declined to subordinate their rights to those of the purchaser, but invited anybody at all to put up a bond on the leins. Lawyers for the S & L's said those leins were their only hope of ever getting a nickel out of those old loans, and they were determined to hold on tight. They asked the judge to let them begin foreclosure proceedings. Lawyers for DPP complained to the bankruptcy court that the S & L's had not "dealt reasonably" with their collateral and should therefore forfeit their rights. They further asked the court to to order the S & L's to pay $900k in "lost profits and value of contract." They further complained that the Real Estate Commission was being heavy handed, requiring that DPP modify mortgages and contracts that were already in effect in order to provide "nondisturbance clauses or partial releases" on time-shares. The DPP lawyers found themselves a loophole. In the 1983 law is an exemption which says that time-shares sold as a result of a court order need not be registered with the Real Estate Commission. Assistant Attorney General Thomas S. Gay said that the exemption applied to individual time-shares, not to projects. Any other interpretation would defeat the legislature's intent of protecting the public. This argument dragged on into 1984, and when the law was enacted, DPP had to stop selling time-shares and seek a decision from the bankruptcy court. I'm simplifying things a bit here, but the long and the short of it is that DPP got its exemption from registration so long as they gave potential buyers adequate warning that the property they were buying was subject to court jurisdiction and leins by lending institutions. Purchasers had to sign a document saying that they read and understood the warnings. DPP said that 673 people had already bought $400k worth of time-shares The requirements of the new law would make further sales more difficult, thereby making default more likely, thereby jeopardizing the investments of people who bought in before the enactment of the law. The judge allowed the exception to protect those purchasers. Judge Fussell consulted with Judge Stewart, who concurred that DPP could go forward so long as they reported monthly to the court to verify that the conditions of the compromise were being met. In 1984, Schrieber's Shepherds replaced the Moore's Madcap Mongrels. For a couple of years, Dogpatch and Marble Falls managed to stay out of the news. Then in 1987 The Entertainment and Leisure Corporation (Telcor) bought Dogpatch for an undisclosed price. Telcor principal Melvin Bell made his fortune in the waste disposal business as head of Environmental Systems Co. of Little Rock. He also headed a company called Creative Culinary Systems, which managed restaurants and trained restaurant personnel. Theme park operation seemed like a natural extension of the restaurant business, so Telcor was created to acquire and operate theme parks. 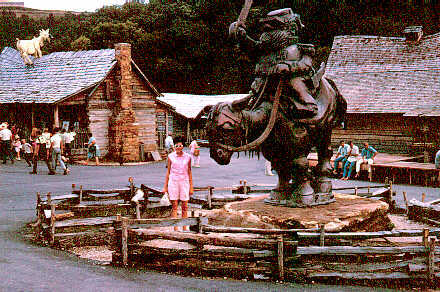 Telcor's other holdings at the time were Magic Springs in Hot Springs, AR and Deer Forest Park in Coloma, MI. Everybody was excited by the acquisition. Bell had tons of business, management and financial expertise as well as lots of cash, which was always welcome. Wayne Thompson remained in his position as general manager and promised $500k would be spent on improvements and a facelift for the park. One new ride was called "Space Shuttle," which seemed a little off-theme for the park. Attendance was reported as being up 60% from the rebuilding year of 1981, and was up 16% in 1986 over the previous season. The park employed 225 at peak season, 4/5 of which were young people. On the hill above Dogpatch, things were going badly for Jess Odom. The U.S. Eighth Circuit Court of Appeals upheld three foreclosure judgements against him involving the three eastern Arkansas S & L's from Wynne, Batesville and Stuttgart. The court held that the bankruptcy judge asserted his juris diction properly. "A good argument can be made that DPP and the Odoms consented to the juris diction of the bankruptcy court." Also, it could be argued that this was a core proceeding, therefore it was proper for the bankruptcy court to assert its juris diction. Wayne Thompson and Melvin Bell had a parting of the ways, and in 1988 Lynn Spradley, a Dogpatch veteran of 14 years, found himself at the helm. Capp's comic strip has been out of print for 20 years. Said Spradley, "A lot of kids don't have any idea who Daisy Mae and Li'l Abner are." 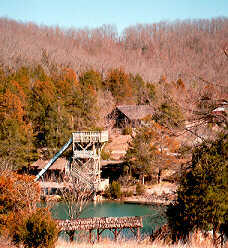 Add to that the location, which has always been a problem, plus the fact that Dogpatch duplicates the attractions of Silver Dollar City, which has the advantage of being next door to Branson, and also duplicates the attractions the Ozark Folk Center in Mountain View, which has the advantage of being a subsidized State Park. Pretty soon you have to agree that the writing on the wall is pretty discouraging. Dogpatch had always been like the others only not as big. The advantage it had was the Li'l Abner theme and the free publicity it provided. That "free" publicity cost the park 2% to 3% off the top and each year for two decades had become less and less valuable. Spradley said that Dogpatch had to spend more per customer on promotions than any other comparable park, just to get people in the gate. Through it all was the trout farm. In May of 1988 the Gazette ran a feature article on the managers of the Dogpatch trout farm, Earnest Raney and his son, the grandson and great-grandson of Albert Raney, the man who built the trout farm in 1933. Melvin Bell decided on a new direction for Dogpatch in 1991. Nix the Li'l Abner characters and save a bundle. Change the name to Dogpatch, Arkansas, saving money on licensing fees to the Capp estate. No entry fee. Tickets for rides and attractions were sold individually. Emphasize Arts and Crafts over shows and rides. In November of 1991, Lynn Spradley left the Dogpatch organization to become a self-employed plumber, and the general manager position went to 11-year Dogpatch veteran Shirley Cooper. In a 1991 divorce settlement Bell's wife Darlene was deeded Magic Springs, one of Telcor's other parks. In May of 1992 a reporter visiting the park noted that the public address system on the West Po'k Chop Speshul was on the fritz and so the main ride lacked commentary. There were new rides like the "Twister," which was a garden variety tilt-a-whirl. The park was closed in 1993 and the official name of the town was changed back to Marble Falls in 1997. Funny thing about that. The name change in 1997 required county government sponsorship and a petition by residents. All those records are on file and easy to find. Reporters noted that the records changing the name from Marble Falls to Dogpatch could not be found. Residents claimed that the postal designation had been changed against their will. 1 August 1998 was the last day you could get a Dogpatch postmark. In 1994 part of the property, not the village and not the rail line, was sold to Jim Brines of St. Louis, MO, who represented unknown investors, two of whom turned out to be local residents Jaro and Wanda Finney (who made their home on the property) and a guy from St. Louis, Ford Carr. (I wonder if he's related to Ford Prefect.) These guys were doing business as Westek Corp. and Leisure Tek, Ltd. For a while, Carr and the Finney's considered converting Dogpatch into a movie ranch, but that never happened. So as far as I know, that's where the matter stands. The park is abandoned, and Westek has been paying property taxes on part of it. The village and railroad were set to be auctioned 30 September 1997 by the State Land Commission pending reciept of about $50k in back taxes covering the Telcor years. The starting bid was to be $257k. People are forever coming up with ideas to revitalize the park. Even though the locals don't care for the poredumignernt hillbilly stereotype, the park was an important source of income for a county which is one of the neediest in the state. The median income in Newton County was just over $11,000 in 1997. On top of that, 60% of the land in Newton County is National Forest, so that property generates no income for local government, infrastructure and improvements. One plan was to turn the park into an ecotourism one-stop, where you could get outfitted for hiking, trail rides, hunting, fishing, canoeing, spelunking, cycling and climbing. The park would be the hub for shuttles to trailheads and river access points. It would be a headquarters for guides and teachers and would provide shop space for sporting goods stores as well as local arts and crafts. You could take a fly fishing lesson at the trout pond or a mountaineering lesson in Bottomless Canyon. And as long as there are a bunch of people gathered there, what's the harm in offering a few rides and a few shows? That was the plan offered by the University of Arkansas. 30 students, 1 graduate assistant and 4 professors were paid $8000 to organize focus groups and conduct feasibility studies. They also came up with a phoney baloney slogan: "Experience the Ozarks." One associate professor, Rick McWhorter, demonstrated the art of vagery to his students, "We wanted to incorporate more things and we wanted to use a niche that is in existence." So. Mister. Want to buy a theme park? I visited with title people at the Newton and Boone county courthouses. I was told that it would take months to straighten the paperwork out, assuming that an interested buyer could be found; and they're not going to begin that buerocratic ordeal unless they've got some indication that you're in earnest. Then if you do manage to acquire the land, sit down and make yourself a list of all the people who might show up with a lawyer claiming that this little bit or that little bit belongs to them. Unless there's a quitclaim you'll never get a good night's sleep. Sources: As usual, Arkansas Gazette and Democrat/Gazette articles too numerous to mention. The Arkansas History Commission in Little Rock also had two fat files of clippings from the Harrison paper and lots of old brochures and publicity photos. Information obtained from interviews are referenced within the text of the article. If you want a citation for a specific fact, e-mail me at Traveogue. A. No registration with the Agency shall be required if the Developer is registered and there has been issued a Public Offering Statement or similar disclosure document which is provided to Purchasers under the following. 1. Securities and Exchange Act of 1933. 2. Arkansas Statutes Annotated Section 67-1235 et. seq. also known as the Arkansas Securities Act. 3. Federal Interstate Land Sales Full Disclosure Act in which the Time-Share Program is made a part of the subdivision that is being registered. 4. (a) Any federal or state act which requires a federal or state agency to review a Public Offering Statement or similar disclosure document which is required to be distributed to Purchasers, if the agency determines after review that the Federal or State Public Offering Statement is substantially equivalent to that required by this Act, and issues its certificate or exemption. (b) Whenever such Public Offering Statement is amended and at least annually in any event, the Public Offering Statement shall be submitted to the agency for its review and re-certification. (c) Applicants for certificates of exemption shall pay a filing fee of $300.00 and any necessary investigation expenses as set forth in Section 4-103(c) hereof. 5. A gratuitous transfer of a Time-Share Interval.